How we make the best homemade fluffy pancakes. 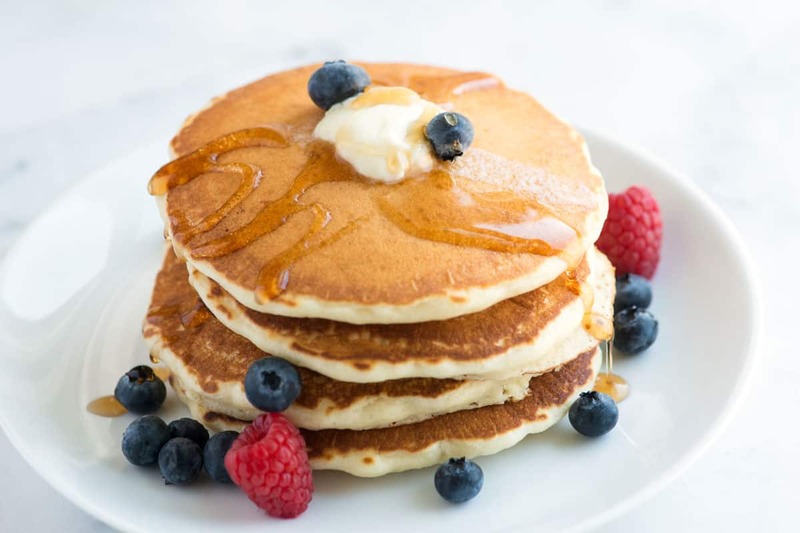 This easy recipe makes pancakes that are light and fluffy and only calls for a few simple ingredients you probably have in your kitchen right now. Jump to the Easy Fluffy Pancakes Recipe or watch our quick recipe video showing you how we make them. We love simple, no-fail recipes and this recipe is just that. It’s quick to make, and we’re willing to bet you’ve got everything you need to make them right now. In the past, we called on boxed pancake mixes. Not anymore. Boxed mixes are great, but everything needed to make delicious pancakes already sits in our kitchen. We said goodbye to the pancake mix and haven’t looked back since. This recipe is easy! The pancakes aren’t too sweet and are lightly scented with vanilla. They are delicious AND they are easily adapted to what you have in your kitchen. Let’s do this! Flour: Use all-purpose flour or whole wheat. A combination of the both is nice, too. For pancakes without all-purpose flour, use your favorite gluten-free flour blend or try buckwheat flour (here is our buckwheat pancake recipe for you to take a look at). Sugar: We use granulated sugar, but you could experiment with brown sugar. Brown sugar will make the pancakes a little moister. 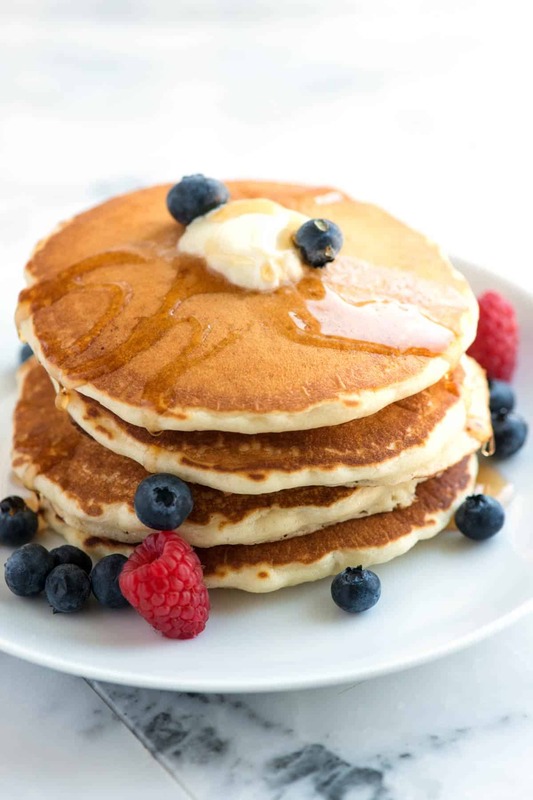 Baking Powder: Baking powder makes the pancakes so light and fluffy. If you’d like to make pancakes without baking powder, I’ve shared tips in the frequently asked questions below. Salt: We like to use 3/4 teaspoon of coarse salt (or 1/2 teaspoon of fine salt). It balances the sugar nicely and brings out lots of flavor in the pancakes. If you are using salted butter, you may want to reduce this. Milk: We usually stick to reduced-fat milk, since that’s what we have in the fridge, but whole milk or skim milk will work, too. For pancakes without dairy milk, substitute non-dairy milk (like unsweetened almond or coconut milk). I’ve also used orange juice in place of the milk before and it worked nicely. Melted Butter: You can’t beat the taste of butter for this, but we’ve found that melted coconut oil is delicious. We use unsalted butter, but salted butter will work as a substitute. If you do use salted butter, you might want to reduce the amount of salt called for in the recipe below. For pancakes without butter, substitute melted coconut oil. One Egg: The egg adds structure and helps with how light and fluffy the pancakes become. I’ve shared tips in the frequently asked questions below for making pancakes without egg. 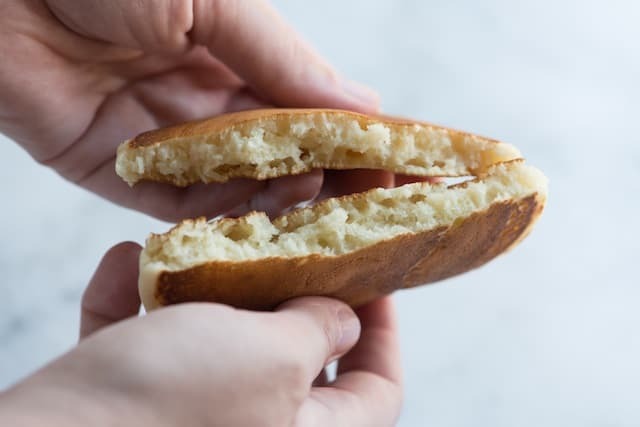 Here’s the secret to the fluffiest pancakes: Mix dry and wet ingredients separately at first then combine just before cooking. 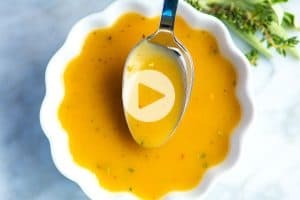 You can mix the dry ingredients as much as you want and do the same for the wet ingredients, but when the two mixtures come together, use a light touch. Over-mixing pancake batter is a common mistake — it makes them heavy and flat, not fluffy. By the way, these tips apply to waffles and muffins, too. We use this same strategy when making our favorite blueberry muffins as well as our favorite waffles. When we are ready to cook the pancakes, we combine the two mixes with a fork or whisk. I like to stir until I no longer see dry clumps of flour. There can be some small lumps, though. See how fluffy these pancakes are? The recipe makes 8 pancakes, so depending on how many you eat at one sitting, this recipe could serve 2 to 4 people. If you have pancakes leftover, you can freeze them! I love this trick for when just one of us wants pancakes in the morning. Check the frequently asked questions below for how we freeze pancakes. Can I make pancakes without baking powder? Yes, absolutely. To use baking soda instead of baking powder, you will need to swap the milk for sour milk or buttermilk and use 3/4 teaspoon of baking soda. If you do not have buttermilk, you can make homemade buttermilk or “sour milk” by stirring 1 tablespoon of lemon juice or vinegar into the 1 1/4 cups of milk called for in the recipe and setting it aside for 10 minutes. The addition of sour milk is required because, unlike baking powder, baking soda needs acid to work in the recipe. If you go with the baking soda/sour milk combination, the pancakes will be just as fluffy as the original recipe. How to make pancakes without egg? For pancakes without egg, we use a flax egg. To make a flax egg, mix one tablespoon flaxseed meal (ground raw flaxseed) with 2 1/2 tablespoons water. Set it aside for about 5 minutes to thicken then use to replace the egg in the recipe. Can I make the pancakes ahead of time? Can I freeze the pancakes? Yes! Pancakes are perfect for freezing and reheat nicely. This way, you can have pancakes for one, two or more any day of the week. To freeze pancakes, cook them, and then lay them out in one layer on a baking sheet. Place the baking sheet into the freezer for 20 to 30 minutes (or until the pancakes are hard). Then divide them between freezer bags with a sheet of parchment or wax paper between them (so they don’t stick to one another). To reheat the pancakes, use the microwave or oven. To microwave, place pancakes on a plate and microwave for 20 seconds for one pancake or longer for multiple pancakes. To reheat in the oven, package the pancakes in foil then place into a 350F oven for about 10 minutes. These pancakes are light and fluffy and made entirely from scratch. They’re not too sweet and are scented with vanilla, making them extra delicious. These are easy to adapt — try adding a handful of berries, nuts or chocolate to the batter. *We call for unsalted butter in the recipe. You can use salted butter, but you may want to reduce the amount of salt used. Warm milk in the microwave or on top of stove until lukewarm, not hot (you should be able to keep your finger submerged for 10 seconds). 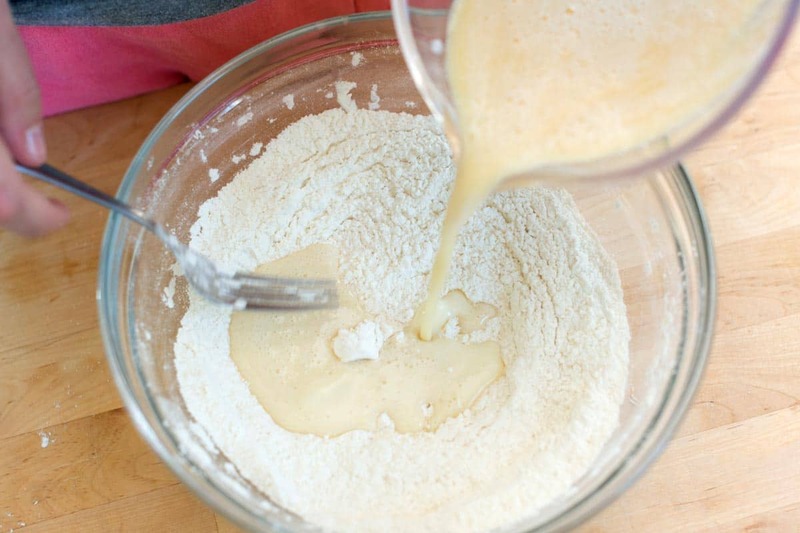 Whisk milk, egg, melted butter, and the vanilla extract until combined. (By warming the milk slightly, the melted butter mixes into the milk instead of turning into small lumps). When edges look dry, and bubbles start to appear and pop on the top surfaces of the pancake, turn over. This takes about 2 minutes. Once flipped, cook another 1 to 2 minutes or until lightly browned and cooked in the middle. 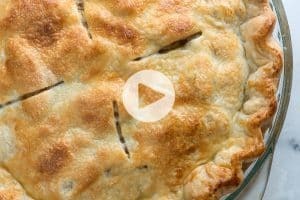 Serve immediately with warm syrup, butter, and berries. When measuring your flour, before you scoop the flour into your measuring cup, fluff or stir the flour in the container (or bag) first. This aerates the flour and makes the measurement more accurate. Alternatively, you can stir the flour in the container, and then scoop it into your measuring cup. Then when the cup is full, use a straight edge to scrape away the excess flour. Doing this prevents adding too much flour to the batter, which causes the dough to be too thick. Substitute for baking powder: To use baking soda instead of baking powder, you will need to swap the milk for sour milk or buttermilk and use 3/4 teaspoon of baking soda. If you do not have buttermilk, you can make homemade buttermilk or “sour milk” by stirring 1 tablespoon of lemon juice or vinegar into the 1 1/4 cups of milk called for in the recipe and setting it aside for 10 minutes. The addition of sour milk is required because, unlike baking powder, baking soda needs acid to work in the recipe. If you go with the baking soda/sour milk combination, the pancakes will be just as fluffy as the original recipe. Hands down. Best pancake recipe I’ve ever tried making or eating. Thank you!! Today I wanted pancakes, had only made them twice in the past and were terrible, found this recipe and made the best pancakes ever! I used Self-raising flour and 1 tsp baking powder instead and got the same result. You have a fan for life! I usually buy and use Hungry Jack Complete pancake mix. Recently, due to the influence of a friend, I started becoming more aware of a lot of questionable ingredients added to processed foods and mixes. I googled homemade pancakes and several sites caught my eye. Yours stood out because it had the words “fluffy” which are my favorite type of pancakes. I can attest that this recipe created the best-tasting, fluffy pancakes that I’ve ever made. I’m a fan of yours for life! Can this better be made and left overnight? Hi there, we have done this. The pancakes turn out, just a little less fluffy. I’ve never made anything from scratch, and i was scared to death they wouldn’t turn out right but….THESE WERE THE BEST PANCAKES EVER! My go-to pancake recipe now! Love it! Best pancakes we’ve made so far. I used 1/2 coconut oil and and 1/2 butter, both in the recipe and in the pan for cooking. Delicious! Absolutely love this pancake recipe. 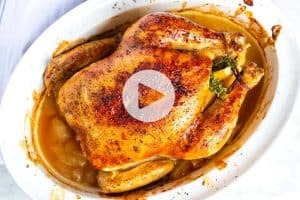 What changes do you recommend for a double recipe? Hi Christina, I’d just use a larger bowl and double all ingredients. Terrific fluffy pancakes. I really appreciate the explanations and substitution recommendations. Very helpful. Thanks a lot! Snow day for the kids here in Ottawa. Made pancakes and got thumbs up from kids !